The Bishop Dwenger High School girls cross-country team has finished a stunning season. Not only did the Fort Wayne team make it to state for the second consecutive year, but it placed sixth overall in that Oct. 27 meet. The team was led by junior Erin Strzelecki, who returned to the LaVern Gibson Championship Cross-Country Course for her third straight year. Strzelecki placed second, with a time of 18:00; once again breaking the Bishop Dwenger girls record that she has held since her freshman year. Following Erin were Katie Woods, 27th; Nora Steele, 41st; Katie Nix, 137th; Aileen Delaney, 145th; Susie Beeber, 173rd; and Anna Morris, 174th. Overall, the Lady Saints placed first in four meets this season, including the SAC Championship. Coach Crum also said that the team’s experience played a major role in their success this year, because five out of the seven girls who ran in the state competition this year had run on the 15th-place team in 2017. Senior captain Isabel Knight attributes the team’s success to “our trust in one another. We are a Christ-centered team and we supported each other through the entirety of the season.” Before each race, the team prays a Hail Mary, before asking for the intercession of St. Sebastian, patron of athletes, and Mary Queen of All Saints, patron of Bishop Dwenger High School. Not only does this team pray together, but assistant coach Bob Sedlmeyer gives the team a Christ-centered “pep-talk” on the eve of each meet. Before their final race at Terre Haute, coach Crum reminded the girls that he would be proud of the team no matter what the outcome. The girls set foot on the starting line, the race started and as they approached the 600m mark, Strzelecki could be seen near the front of the pack. As the race went on, she held that lead, crossing the finish line only seven seconds behind Greencastle’s Emma Wilson. The other Saints finished strong as well, but at first it was unclear whether they had achieved their goal of top 10. The 24 teams gathered around the podium to hear where their months of hard work and sacrifice had gotten them. The announcer slowly counted down the results toward the top 10. Smiles broke out across the Bishop Dwenger crowd after he announced 11th place. They knew that they had achieved their goal, but little did they know they had surpassed it by four places. The Saints cross-country program continues to add talented runners to the team. 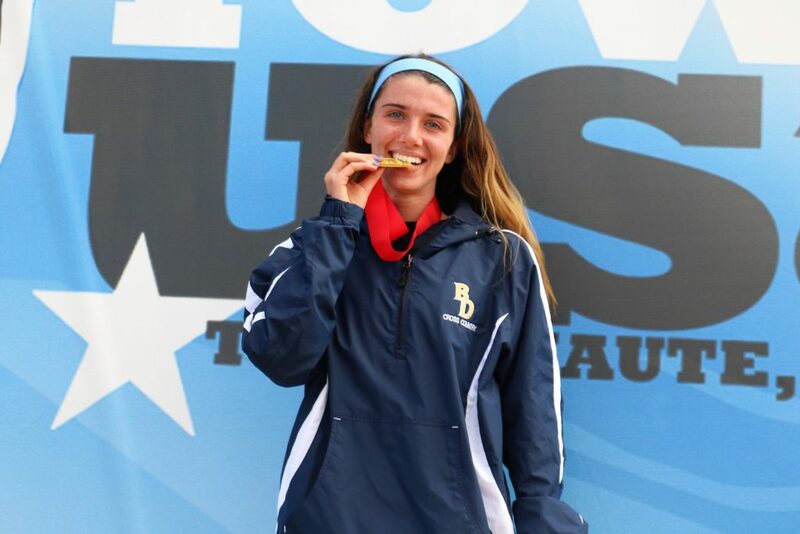 Freshman Katie Woods finished second, with a state time of 19:04. All the girls who ran at the state meet plan to return to run next year, giving the Saints a good chance of dominating the state competition for seasons to come. 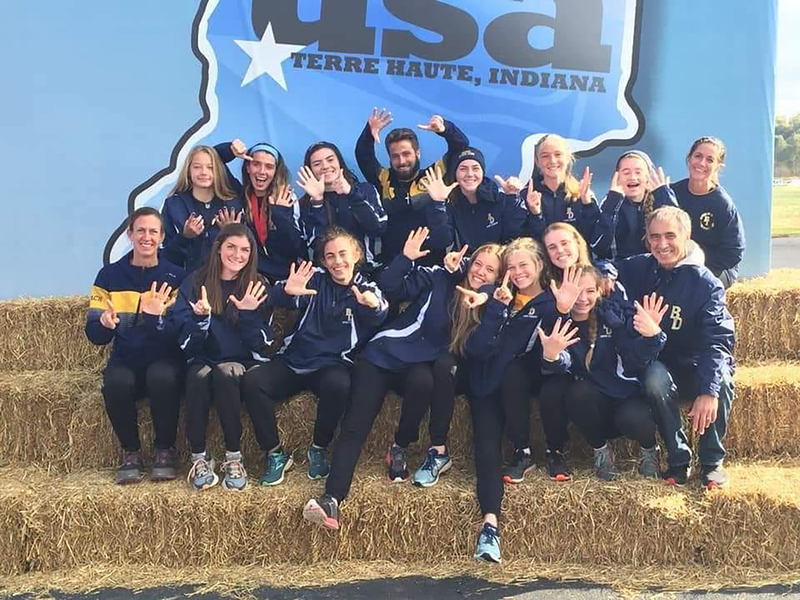 The Lady Saints of Bishop Dwenger High School, Fort Wayne, celebrate the team’s sixth-place finish in cross-country state competition Oct. 27.